It also supports a network of Conscious Capitalism Chapters. These serve as communities of inquiry for business leaders, entrepreneurs, coaches and consultants and others. Some of the companies involved include Whole Foods Market, The Container Store, Leonard Green & Partners, POSCO, The Motley Fool, First United Bank and many others. 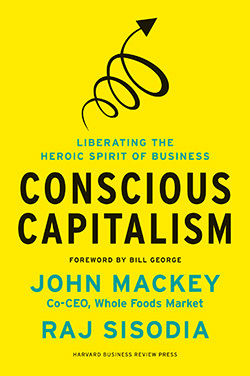 John Mackey, co-founder of Whole Foods Market, and Raj Sisodia, who is a professor and co-founder of Conscious Capitalism, Inc., have published a book on this approach. Conscious Capitalism builds on the foundations of Capitalism – voluntary exchange, entrepreneurship, competition, freedom to trade and the rule of law. These are essential to a healthy functioning economy, as are other elements of Conscious Capitalism including trust, compassion, collaboration and value creation. Conscious Capitalism comes to life as it is applied to business. 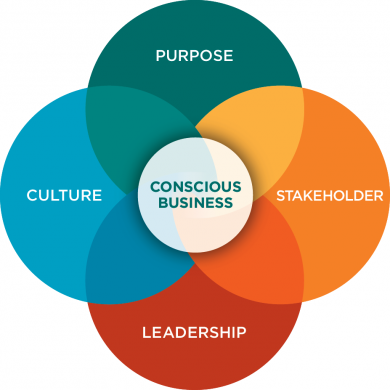 Conscious Capitalism has four pillars guiding and underlying a business that practices Conscious Capitalism. Recognizing that every business has a purpose that includes, but is more than, making money. By focusing on its Higher Purpose, a business inspires, engages and energizes its stakeholders. Recognizing that the interdependent nature of life and the human foundations of business, a business needs to create value with and for its various stakeholders (customers, employees, vendors, investors, communities, etc.). Like the life forms in an ecosystem, healthy stakeholders lead to a healthy business system. Human social organizations are created and guided by leaders – people who see a path and inspire others to travel along the path. Conscious Leaders understand and embrace the Higher Purpose of business and focus on creating value for and harmonizing the interests of the business stakeholders. They recognize the integral role of culture and purposefully cultivate Conscious Culture. This is the ethos – the values, principles, practices – underlying the social fabric of a business, which permeates the atmosphere of a business and connects the stakeholders to each other and to the purpose, people and processes that comprise the company.